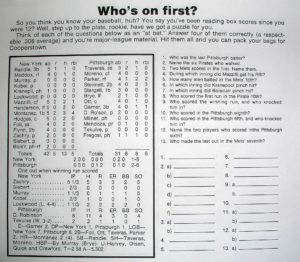 Question #11 – Who scored in the Pittsburgh 5th and who knocked him in? Answer – We’ll be answering this one, in part, as a matter of process of elimination. Fregosi and Taveras scored on Stennentt’s game winner in the 10th (Answer #9). Mendoza (famed for the Mendoza Line) scored in the 8th (Answer #10). Taveras scored his other run in the 6th inning, when he led off the inning with a double. Moreno went quietly, but Parker doubled Taveras home. Siebert was brought in to face Stennett, and gave up the single that brought Parker to the plate with the 2nd run of the 6th inning. This leaves Brye as the only person who could have scored in the 5th, as he is the only run unaccounted for. Brye walked in the 5th, moved to 3rd on Ott’s double, and then scored on a hit by Garner. This gives Garner his lone hit and lone RBI of the game.